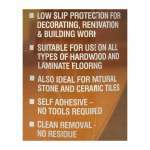 A self adhesive low slip film for use on hardwood, laminate, natural stone or ceramic floors. It will protect expensive hard floor surfaces from stains and damage during periods of decorating, renovation, building work etc. 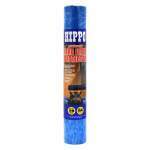 It can be left for up to 28 days and easily removed leaving no residue. No special applicator device is required for use, instead rolls are reverse wound which means they can simply be dropped in place and kicked out to unroll. It is also suitable for vinyl floors.